Recently my good friend the Games Poet (GP) and I settled in for a great Saturday of Day of battle gaming. I chose the Battle of Legnano which pits a German army of all knights against an Italian City State. The German force was marching to join up with it’s infantry portion of it’s army and was blocked by the Italians. 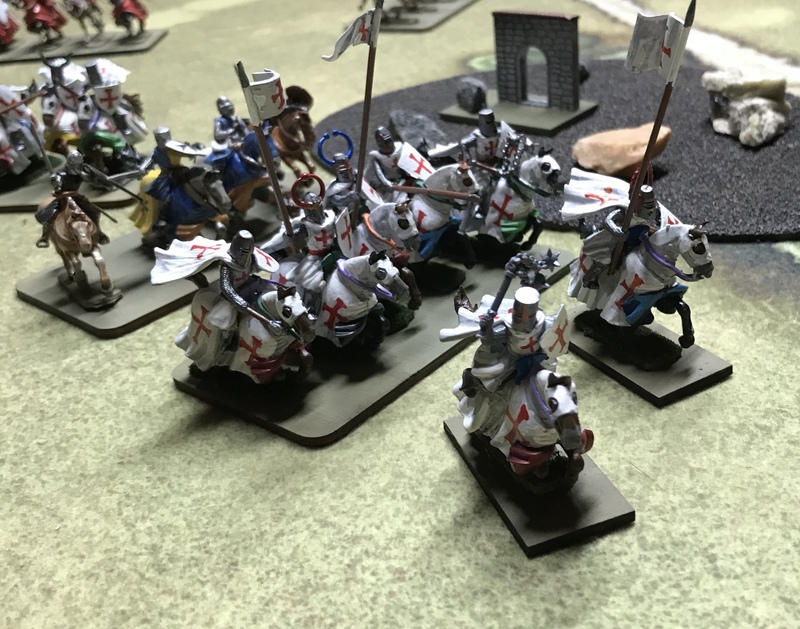 For fun and ease of play we chose the armies from Lion Rampant and doubled them. We then printed out the Day of Battle Domain lists and used the stats for each unit from there. It was quick and quite fun. I then converted half of the foot units in the German army into sergeants and knights and removed 2 as well. Since GP is collecting an Italian Army he chose to play them. 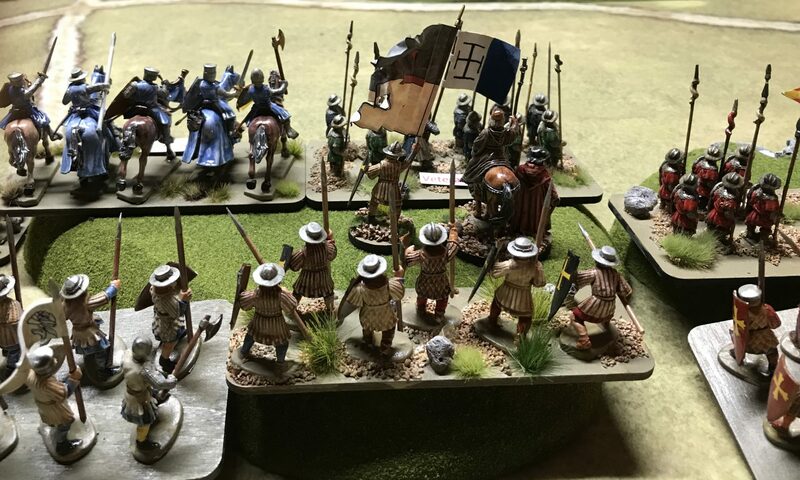 I got to play Germans and blood my newly painted German Holy Knights that were a gift from my brother David. This post simply shows the dispositions at the end of setup and the first turn. The Italians lost the game turn initiative check and I as the winner chose to attack. Not a hard choice seeing I had 8 some odd bases or units on cavalry. First we drew and laid out the terrain. Both of our domains were in mixed terrain and we each drew 2 terrain features. GP placed a gentle slope spot in the middle, then I placed a rough slope opposite his hill. His second feature was a patch of rough terrain that he placed off to his left flank. Finally I drew and placed a rough slope that I used to run my slope all the way to my left flank. As the initiative loser he had to deploy his banner unit, Warlord and banner first, I followed suit. Finally he deployed his army and then I did. I drew first move and volleyed at his spears from my center with my one crossbow unit. I got lucky and got 2 hits. he took one hit and retreated back. The three pictures I am attaching show the hilltop setups and he action from the shooting.